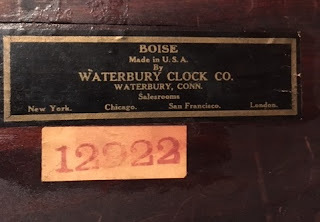 In for repair is an American Waterbury tamber time and strike mantle clock. A nice looking mantle clock This clock was made around the 1920-30's. 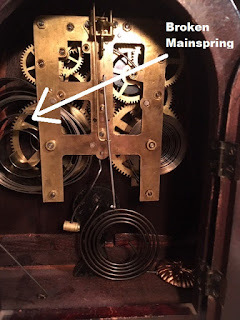 The problem is obvious with this clock, the time mainspring broke. What is not obvious to this clock was any residual damage to wheels and pinions resulting from the mainspring breakage. This damage will not be known until the movement has been taken apart. 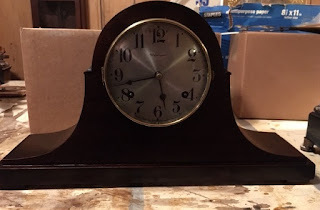 Luckily, there was no damage to wheels and pinions of this clock. 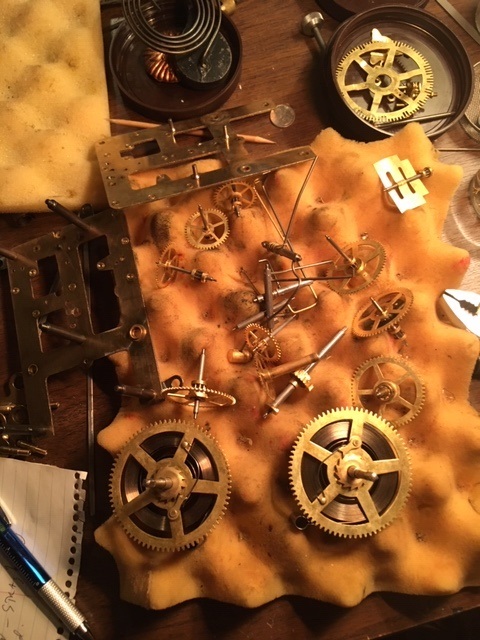 The hardest part of this rebuild was removing the movement from the case. The rest of the rebuild was very much routine. After a few minutes, the movement was removed and the work commenced. There were 10 pivot holes that were warn. The movement plates are made of steel. Most clock plates are made from brass. This was a cost cutting technique in that time period. The steel plates were given a thin brass plating. Brass plugs were inserted in the plates so that the pivots can turn in brass holes. Care was taken to make sure those brass plugs did not move in its steel holes. A small notch was made from the plug to the steel plate. If the plug moved, the notch would not be linear and the plug would have to be repositioned. Given that the pivot hole plugs looked more like plugs than replacement bushings, the decision was to drill the smallest hole possible and plug with the smallest bushing. This was a little more work because the replacement bushing needed significantly more reaming to fit the pivot hole than normal. The upside, the plug would be less likely to move and the new bushing would not be visible. Both big advantages to this repair. Here is a picture of the movement disassembled after all the repairs and cleaning. The movement was assembled and tested out the case. The case was oiled and some of the obvious nicks were repaired. The bezel was polished and glass cleaned. Felt pads were also added to the feet of the case. Once testing was complete, the movement was placed in the case. 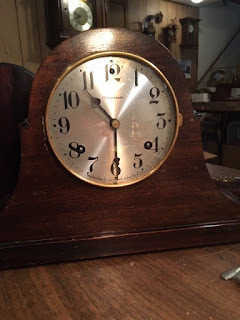 The clock would strike 2 minutes after the 1/2 hours. This was adjusted. After the adjustment, all is well. Here is a picture of the clock after all work was completed and ready to go home.